Sometimes roses are so beautiful that you may wish they would last forever. Luckily, with a bit of time and knowhow, your roses can be preserved. Although air drying is a simple, tried and true method, many experts believe that drying roses in silica gel is the best method of desiccation for roses and other flowers that have thick petals. Silica gel is a drying agent that will extract the moisture from the blooms while leaving their shapes and colors intact. Properly dried roses will last for years. Gather roses that are similar in size. If you are picking the roses from your own garden, harvest them in mid-morning on a dry day. Use only healthy, disease-free roses that are nearly at their peak. Remove the leaves from the stem and cut the stem down to 2 or 3 inches. Spread an inch of silica gel in the bottom of an airtight plastic container. Arrange the roses on top of the silica gel. Add silica gel around and on top of the roses until the blooms are completely covered with the gel. Add the gel a little at a time, jiggling the container after each addition to settle the gel around the roses before adding more. Check the roses after three to five days. Remove the lid and use a soft paintbrush to remove enough silica gel to enable you to access the rose. Touch a rose petal gently. The petal should feel papery and dry. If the rose isn't quite dry, replace the gel and check again the following day. Remove the roses from the silica gel when the blooms are completely dry, and use the soft paintbrush to gently brush excess silica gel from the blooms. Don't over-dry the roses, as the petals will become brittle and break easily. Create a stem with 20-gauge florist's wire. Push the end of the wire horizontally through the base of the rose, with about 2 inches of wire extending from the side of the stem base. Bend the short end of the wire down and wrap it around the longer wire and the rose stem. Cut the long end of the wire to the desired length, then wrap the wire with florist's tape. 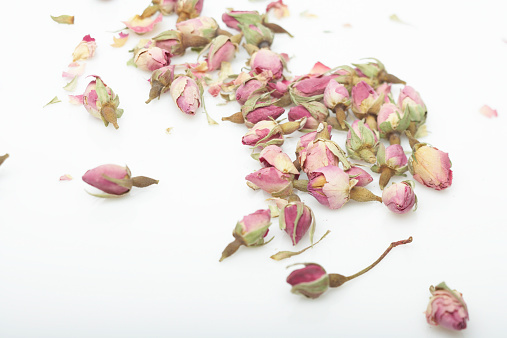 Gather a small bunch of about three to five roses with their foliage removed. Secure the bottom of the stems together with a rubber band. Hang the roses upside down from a hook in a dark, dry, well-ventilated room. Leave the roses for two to three weeks. Remove the dry roses form the hook. Spray the roses lightly with aerosol hair spray to strengthen their petals.